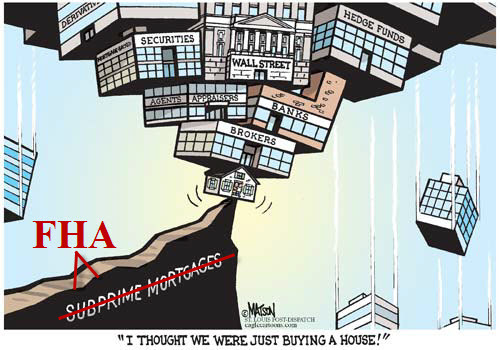 Well, before subprime ended, a whole lot of something else was going on…does any of this sound familiar? Wow, deja vu. Lenders aggressively qualifying anything that breathes into a subprime FHA loan so they can make money on commission. The only difference in how this story ends is that the billions of dollars we paid to the banks last year in bailout money will just be billions of dollars paid to the government this year in bailout money. At least we got rid of the middleman. This is why government should never be involved in trying to manage a market. Moral Hazard, Unintended Consequences, Regime Uncertainty, they wreak havoc on the economy and its citizens, all because of government intervention. When did it ever make sense to let politicians, really just a bunch of lawyers, run an economy? Why are we surprised when they make all these changes that never work and just make things worse?